Ever since the stoning of Stephen, the first Christian martyr (see Acts chapter 7), followers of Christ have been persecuted, oppressed, imprisoned, tortured, and killed for their faith. My last post shared the story of Brother Andrew, who has dedicated his life to helping Christians living in oppressive, atheistic countries. Organizations like Open Doors and Voice of the Martyrs provide support and help to many Christians around the world who are not free to worship and express their beliefs openly. 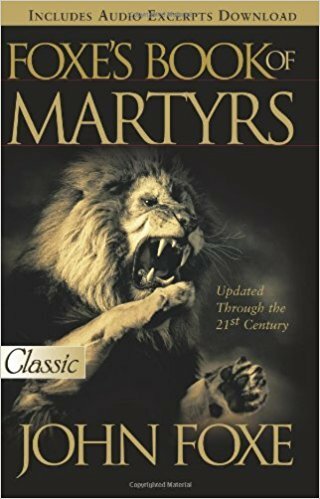 Foxe’s Book of Martyrs, as it came to be called, is a collection of stories of Christian martyrs through the centuries recorded by John Foxe, who was born in England in 1517, the same year that Martin Luther nailed his 95 Theses to the church door in Wittenburg. As a result of his studies of scripture while teaching at Oxford as a devout Papist, Foxe changed his views and came to embrace the reformed doctrines of the Gospel. He was declared a heretic and ejected from the school in 1545. During the bloody reign of Queen Mary in 1553-1558, John Foxe fled to Switzerland to escape persecution. It is estimated that during her reign, 270-280 people, including women and even children, were burned to death as heretics. Originally written in Latin and published in 1550, Foxe translated his volume into English and added to it, and upon his return to England after Queen Elizabeth came to the throne, republished it in 1563 under the title, “Acts and Monuments of these Latter and Perilous Days.” He continued to correct, revise and add to it for several more republications, the 1570 edition having doubled in size from the first to 2300 pages. The complete work covers more than his own time and region, beginning with the Roman Empire in the First Century. before he was 30 years of age, he had read all the Greek and Latin Church writings and had also become a master of the Hebrew language. Foxe was meticulous in his research, not satisfied to leave any stone unturned or any shadow of doubt in any area of inquiry. This quality of research would eventually provide the foundation for the enduring reliability and veracity of his work on the history of the Christian martyrs. In spite of this, Foxe’s Book of Martyrs has spurred controversy as there are those who believe his accounts to be fictional, fabricated, or at least embellished and exaggerated, for the purpose of promoting his views and agenda. But we know that there are always those who would do anything to suppress the truth and discredit those who try to make it known. Just think of those who knew for a fact that Jesus Christ raised from the dead, but willingly promoted lies to cover it up. To this day there are those who deny the resurrection to be a fact, in spite of the testimony of many who witnessed the evidence of it firsthand. It’s indisputable that the accounts of the events that took place close to Foxe’s own time are taken from eye-witness evidence and are well-documented. Foxe explains on the title page of the 1563 edition that the accounts had been “gathered and collected according to the true copies and writings certificatory, as well of the parties themselves that suffered, as also out of the Bishops Registers, which were the doers thereof.” However, Foxe did use his own judgment and was selective about what incidents and details he chose to include in his collection. 1. As testimony to the fact that Christ’s church will prevail and His kingdom shall endure. 2. That God may receive praise for his hand at work in his Church. 3. That the lives of these saints may provide courage and inspiration to others. 4. To expose the errors and cruelties of the Papist (Roman Catholic) church. The tyrants and organs [methods] of Satan were not contented with death only, to bereave the life from the body. The kinds of death were divers [various], and no less horrible than divers. Whatsoever the cruelness of man’s invention could devise for the punishment of man’s body, was practiced against the Christians …Yet notwithstanding all these continual persecutions and horrible punishments, the Church daily increased, deeply rooted in the doctrine of the apostles and of men apostolical, and watered plenteously with the blood of saints. The stories are inspiring and moving to be sure. The strong faith, courage, and even joy demonstrated by these men, women, and children who endured such terrible treatment, pain, and horrific deaths is a testimony to the strength that the Lord provides those who He calls to suffer for His name’s sake. Consider some of the statements made by these martyrs as they faced their final moments. 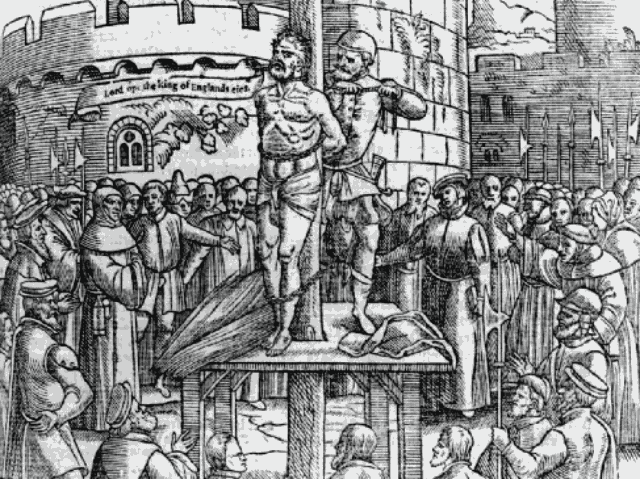 William Tyndale is burned at the stake. Woodcut from an early edition of Foxe’s Book of Marytrs. Interestingly, John Foxe’s work was influential in raising a sense of English nationalism by uniting different Protestant sects against the false church of Rome, and a later abridgment promoted the idea that England was the first and only place in which the true Gospel was being upheld. After his death in 1587, Foxe’s original volume was expanded, abridged, and used as the basis for many later editions and compilations. One writer observed that Foxe’s objective is largely lost in many of the abridged editions of his extensive work, because, “These versions tend to focus on the details of the various martyrs’ sufferings, but largely omit the explanations of the critical reformational truths for which the martyrs were willing to suffer and ultimately die.” Certainly it is important to be aware not only of how these individuals died, but why. It has been said that if you have nothing worth living for, then you have nothing worth dying for. These men and women of faith knew and held tightly to what they believed and experienced the reality of the Apostle Paul’s words, “For me to live is Christ, but to die is gain.” Christian, can you say this is true of your life as well? This entry was posted in Christian Books, History & Biography, Non-Fiction and tagged book of martyrs, Christian martyrdom, John Foxe, persecuted church. Bookmark the permalink. I grew up reading Foxe’s Book of Martyrs. However, until about a year ago, I failed to realize that Foxe blatantly omitted the multitude of Anabaptists killed by the Protestant church. This seems to me like a grave error. Their testimonies are found in Martyrs Mirror. One difference between the Anabaptist movement and the rest of the Reformers was that while most of the Reformers were willing to stand up and fight for what they believed, the Anabaptists were willing to lay down their lives for what they believed– and many did. As a Baptist, you may be interested to learn that the Anabaptists believed that baptism should be for people upon confession of faith, and so were being baptized again as adults. This is where the name “Anabaptist” comes from, meaning re-baptism. The reformers, which in their day represented the state church, acquired its members through baptism at birth. Some Baptists trace their heritage to the Anabaptists, though they stop short because of their differences in beliefs such as nonresistance, separation of church and state, and free will.